Hands-free phones should be banned and drivers should be forced to switch off their mobiles when behind the wheel, according to a road safety group. 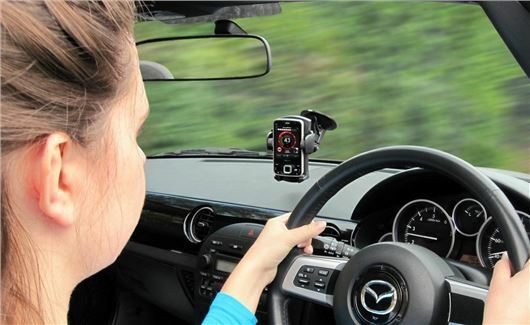 The road charity Brake wants the Government to ban all Bluetooth systems and has urged drivers to stop ‘fooling themselves’ when it comes to multi-tasking behind the wheel. According to research from Brake, 98 per cent of motorists are unable to use a hands-free system without it affecting their driving ability. Following a Freedom of Information request, Brake has discovered that more than half a million UK drivers (575,000) have points on their licence for using their mobile phone at the wheel or being otherwise distracted, with one in 15 of these drivers having six points or more for driving distracted behind the wheel. To combat the problem, Brake has launched a national campaign to urge drivers to tune into road safety, to prevent appalling crashes caused by multitasking at the wheel. The campaign appeals to drivers to turn off their phones or put them in the boot, and urges everyone to refuse to speak on the phone to someone who's driving. The campaign is being launched almost exactly a decade after hand-held mobiles were banned at the wheel, and coincides with a week-long police enforcement campaign. "We're living in an age when being constantly connected is the norm; more and more of us have smartphones, and find it hard to switch off, even for a minute,” said Julie Townsend, deputy chief executive of Brake. “While there are enormous benefits to this new technology, it's also posing dangerous temptations to drivers to divert their concentration away from the critical task at hand, often putting our most vulnerable road users in danger. We're calling on UK drivers to tune into road safety: turn off your phone or put it in the boot, and never try to multi-task at the wheel,” added Ms Townsend. However, the Government has said it has no plans to change the law. Road Safety Minister Robert Goodwill said: "The UK has one of the best road safety records in the world and improving this record remains a top priority for the Government. That is why we have increased fines for using a mobile at the wheel, made it easier for the police to tackle bad driving behaviour and we are looking at how we can improve young driver safety. I welcome Brake's Road Safety Week initiative which helps raises awareness of the importance of road safety." It's all very well to ban something. Enforcing it is the problem.